Mango lassi is gaining popularity worldwide. It is made from yogurt, water, and mango pulp. It may be made with or without added sugar. In various parts of Canada, mango lassi is a cold drink consisting of sweetened Kesar mango pulp mixed with yogurt, cream, or ice cream. It is served in a tall glass with a straw. Mango lassi is gaining popularity worldwide. It is made from yogurt, water, and mango pulp. 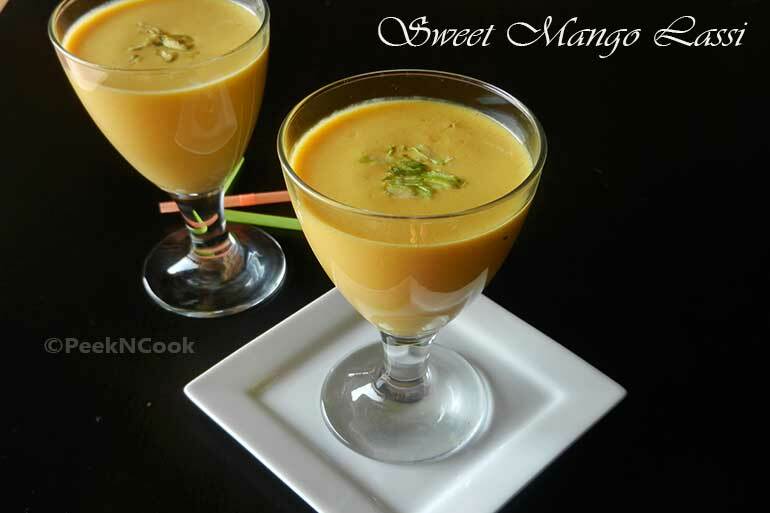 Sweet and rich mango lassi, with mango, milk, yogurt, sugar and a dash of cardamom. Blend the mangoes, yoghurt, ice-cream, rock salt and sugar. Adjust sugar according to taste. (Sugar amount will depend on the sweetness or sourness of the mango and yogurt) . Add cardamom powder & water and blend again. Pour in tall glass and garnish with chopped pista & saffron threads. Serve chilled. Before serving add some chopped pistachios,saffron on the top of lassi. Mango can be replaced by any juicy fruits, you want.